Shined and cleaned and ready to wear! Very pretty, feminine and springy! This item is retired. Wear it as a pin or on a chain as a pendant. In excellent condition! Condition: Very fine estate condition. We do our best to describe all imperfections but rely heavily on photographs to convey the bulk of condition information. Likely used rarely, if ever. Condition Guide. Product ID: 752825. Stones: Black Onyx. Profile: Brooch. Ring Sizes. Natural Stones. Product ID: 752819. Profile: Brooch. Ring Sizes. Natural Stones. Marked - Jezlaine 925. I have added a removable sterling silver pin converter. The chain IS NOT included. Stones: Onyx, White Stone & Lapis. Profile: Brooch. Product Details. Product ID: 753345. Ring Sizes. Natural Stones. Condition is Pre-owned. The charms are Teacher related charms and not daughters and sons. It is possible that the color of your piece is different in person than the photograph I have provided. Hello. For sale I have a sterling silver James Avery “Tender Loving Care” lapel pin. Overall the pin is in pre owned shape. There are normal scratches, scuffs from normal wear as well as tarnishing (I am more than happy to clean the pin if you request). The pin measures about 26mm by ~10mm and weighs approximately 2.2 grams. You will receive the pin as well as the backs (the quarter in the photos is for reference only). If you have any questions please feel free to ask. Thanks for looking and have a great day. Product ID: 752814. Brooch style: Designer. Profile: Brooch. Ring Sizes. Natural Stones. Product ID: 752879. Stones: Carnelian. Profile: Brooch. Brooch style: Germany. Ring Sizes. Natural Stones. 925 Sterling Silver (Marks: 925). Any item sold by the Seattle Goodwill is eligible for local pick up at our warehouse. This also applies to combined orders. No exceptions can be made. Because Jobs Change Lives! Great Fall Metal Works Sterling Silver Walking Cat Brooch 3 1/2"
This also applies to combined orders. General Notes on Testing Any item sold by the Seattle Goodwill is eligible for local pick up at our warehouse. No exceptions can be made. The shape of the skis suggest that they are facsimiles of Wood Skis. Hand written on the top of one ski is the wordJNNSBRUCK in black paint. The pin back functions normally and appears to be silver plated brass, as does the applied plaque. 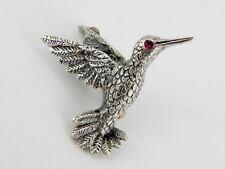 Here is a stunning, sterling silver pin of a flying duck, designed by well-known sporting artist, Lynn Bogue Hunt. Height is 3 1/8"; weight is 14.17 grams. Wonderfully realistic! Product ID: 752918. Brooch style: Pin. Profile: Brooch. Ring Sizes. Natural Stones. Product ID: 752878. Profile: Brooch. Ring Sizes. Natural Stones. We are not able to make any exceptions to this policy. We will not send a combined invoice unless it is requested. Product ID: 752813. Profile: Brooch. Ring Sizes. Natural Stones. Product ID: 752824. 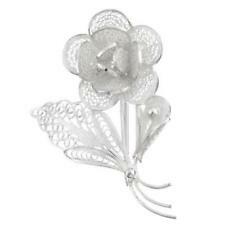 Brooch style: Filigree. Profile: Brooch. Length: 2.5". Ring Sizes. Natural Stones. This beautiful brooch/pin features an exquisite Art Nouveau-era Floral Leaf design in Sterling Silver and is highlighted with a stunning Oval Spiderweb Turquoise cabochon so I KNOW it has a spot in your collection, or would be a perfect gift! Retired Vintage James Avery Sterling Silver Brass Tree Pin Brooch 2"
Retired Vintage James Avery Sterling Silver Brass Tree Pin Brooch 2". Condition is Pre-owned. Shipped with USPS First Class Package. 925 Sterling Silver. Net proceeds from the sale of these goods and financial donations from the community make it possible for us to operate our free job training programs. We do our best to provide accuracy. Product ID: 752781. Profile: Brooch. Ring Sizes. Natural Stones. Product ID: 752989. Brooch style: Pin. Profile: Brooch. Ring Sizes. Natural Stones. James Avery Dancing Playing Children Brooch Pin Sterling Silver Retired . Condition is Pre-owned. Shipped with USPS First Class Package. New ListingVintage Hobé 1/20th 14K on Sterling Silver Flower Bouquet Brooch 3.75"
All gem stones are tested using the Presidium Gem Tester. The Presidium Gem Tester distinguishes between genuine gem stones and simulants such as glass or plastic but it cannot distinguish between synthetic/man-made stones and natural stones. 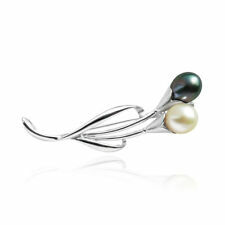 (Gift And Jewels® BEAUTIFUL STERLING (.925) SILVER FAUX PEARL 5 GRAMS FINE JEWELRY BROOCH). Gift And Jewels. 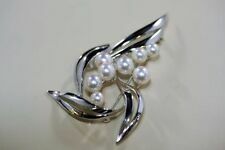 Vintage Sterling Silver Star Pendant Brooch Pin Marked “Sterling Mex.”. Condition is very good! Ask questions. See pictures as they are part of the description. Payment required 3 days. Combined shipping available. IT IS RATHER HEAVY AS WELL NOTE THE BASKET SETTING IT IS IN FLANKED BY THOSE GORGEOUS DIAMOND CUT MASTICATES. 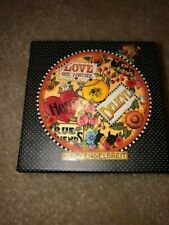 THIS IS A BEAUTIFUL PIECE, YOU WILL BE VERY HAPPY. 925 Sterling Silver. Amber : 9.6mm. Any item sold by the Seattle Goodwill is eligible for local pick up at our warehouse. No exceptions can be made. This also applies to combined orders. Overall Condition. Sterling Silver .925 Dog Pin Jewelry . Condition is Pre-owned. Shipped with USPS First Class Package. Does NOT include anything extra! 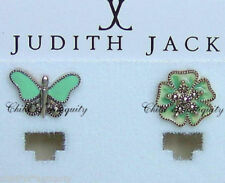 This is for the brooch and the Tiffany blue pouch only! There are light scratches and scuffs on the front of the brooch and on the back as well but nothing major and nothing that's really noticeable. Vintage 800 silver(80% silver) brooch with snake eye turquoise and other colored stones. The stones have not been tested. There are dark and light green as well as red stones with turquoise stones on each corner. Measures 2 1/8 inch at its widest. It is in in great shape for its age with only a few marks from use. Please see all pictures and feel free to ask any questions. Possibly Native American? . Marked 800 on back. Clasp works perfect. 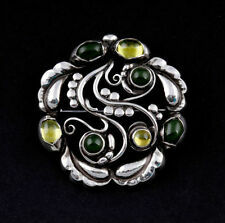 (Gift And Jewels® G.LAFFI SIGNED STERLING (.925) SILVER GEMSTONE 4 GRAMS BROOCH PIN). EXCELLENT SERVICE. 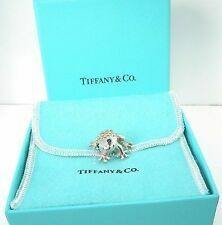 James Avery Retired Sterling Silver Lion Brooch or Pin. Preowned but in very good condition. Any questions, please ask. Texas residents are subject to 8.25% sales tax. Vintage sterling silver Winnie the Pooh pin by Van Dell. Solid sterling silver. Pristine condition, appears seldom worn. Measures approx. 1” x 7/8”. Marked DISNEY, VD for Van Dell, and SS for sterling silver. Photos are greatly enlarged and of the actual item you will receive. Thanks! Product ID: 752709. Profile: Brooch. Length: 2.5". Ring Sizes. Natural Stones. 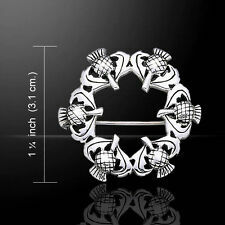 Sterling Silver Dragon Pin Brooch Indonesia. Condition is Pre-owned. Measures 1 1/4” wide by 1” high. Marked on back .925 and Indonesia. Weight is 7 pennyweights. Shipped with USPS First Class Package. Please email questions. I ship to the United States only and accept PayPal. As a collector myself I know there is nothing like examining a piece in the sunlight to really see the quality,details and most of all condition. Vintage Silver 925 CATERPILLAR Pin Brooch, 1 3/8" Super Adorable! Vintage Sterling Silver Skeleton Key Brooch Pin 1.75"